It's very similar to store bought potato bread but much, much better. 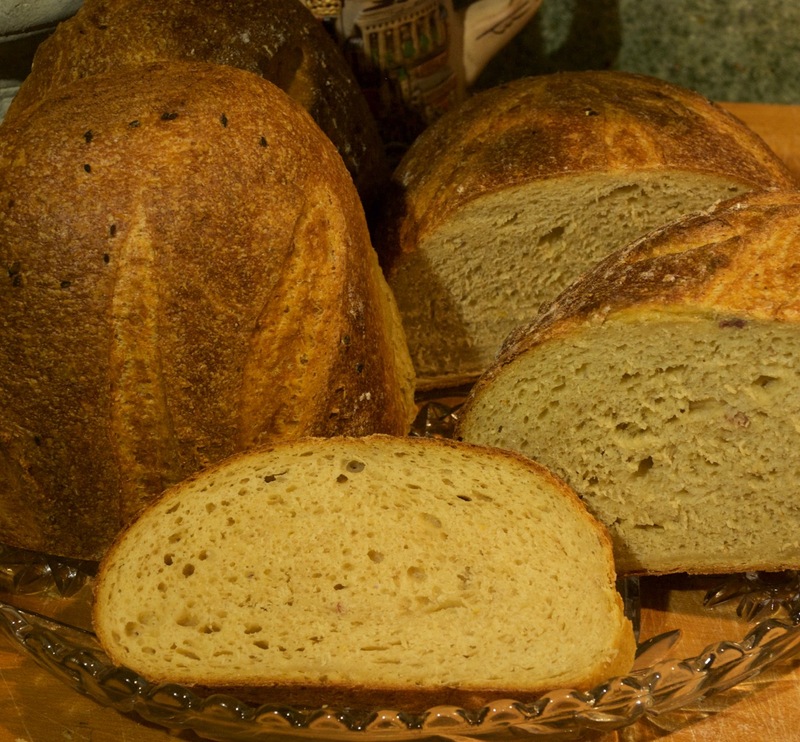 The ricotta cheese combined with the sweet potatoes and red potatoes really gave the crumb a nice soft and moist texture which is perfect for this type of bread. The crumb was not terribly open, but that's okay, since who wants your sandwich fillings pouring out anyway :). I tried Teresa Greenway's Stegosaurus scoring technique from Northwest Sourdough, which you can see here for one of the loaves and it came out pretty good but I realized I didn't follow her directions exactly so I have a partial Stegosaurus bread :). Straight Version with no Levain (This is per request in comments). Beautiful colour on those loaves! This one did have a wonderful gold color from the Durum and potatoes. I think Yams are pretty much the same so I'm sure it would work fine. I'm with LL, the color you got on those loaves is lovely! 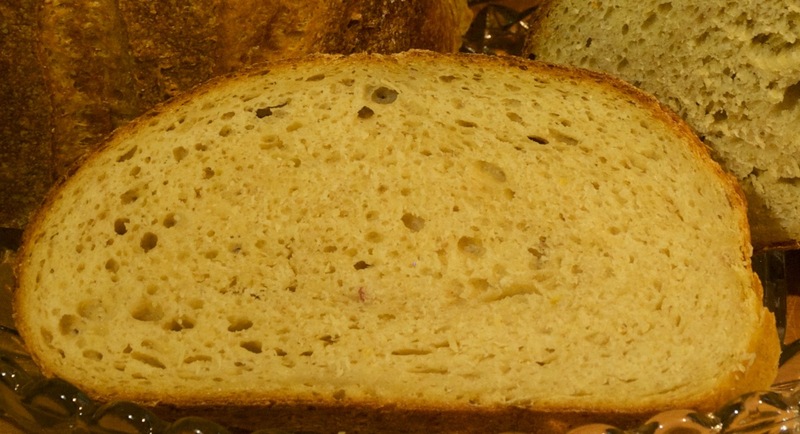 The crumb is perfect for sandwiches, holey bread makes for very messy (and frustrating) sandwiches. Thanks Ru. Appreciate your kind words and glad you liked the post. I'm going to grill some slices up tonight to use for a hamburger with cheese and grilled onions. forte! Plus a return to ricotta and potatoes too! Just to much take in when out of town. The crumb on this one looks spot on. Well done and happy baking. Congrats on the daughters graduation. I'm sure you must have been very proud of her and sounds like you made quite the spread for family and friends! The NY gang says hi to lovely Lucy and Happy Baking and eating! How do I know? I made it!!! Everyone in the family loves it! I'll post the results when I get a chance. School starts tomorrow, very busy weekend. Thanks for sharing! So happy to hear you gave this a try and liked it. Look forward to reading your post. 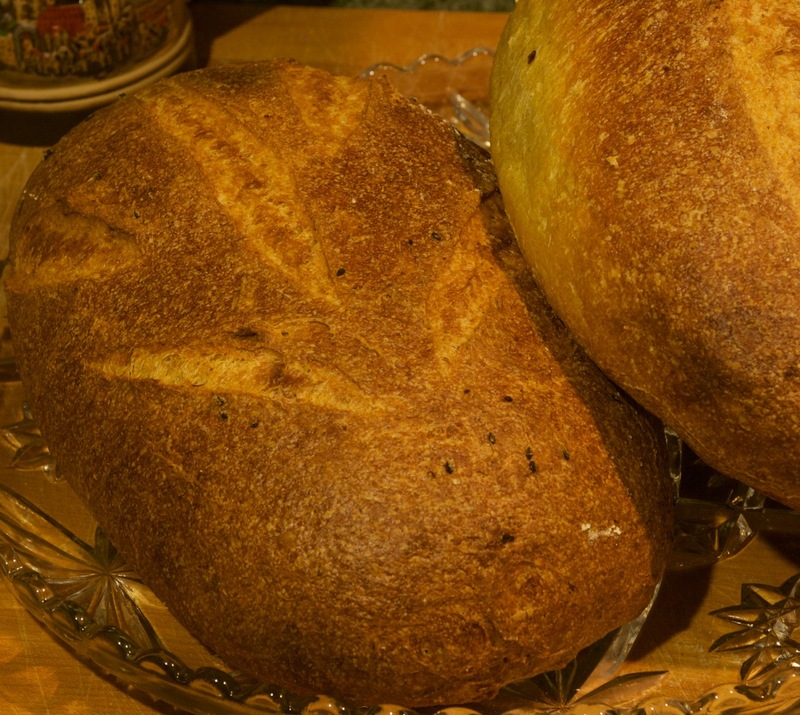 A hearty winter bread in the Summer? At least in the Northern Hemisphere... That's what it seems like to me. Maybe a really tasty combination with a thick soup for cold winter nights (although we don't see many cold winter nights in our latitude ~26 degrees North). 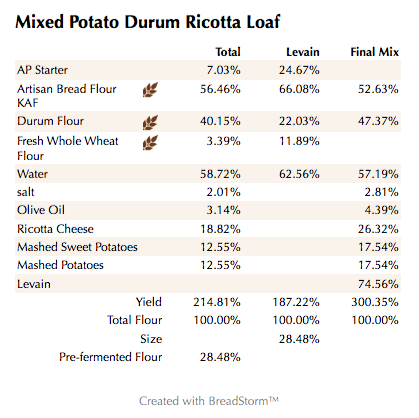 I've never baked with either potato or ricotta. Is a tight crumb typical for these additions? I love the look of the crumb as is on this one. Not too hearty but certainly tasty and perfect for sandwiches and even great grilled with some garlic butter and grated cheese! I wouldn't say that the tight crumb was due to the potatoes but I guess it could depend on how much you use and probably combined with the cheese it did tighten it up a bit. It's not like this was a dry bread, if anything it was very moist. I already have 2 dogs and 5 cats so what's one more dinosaur? 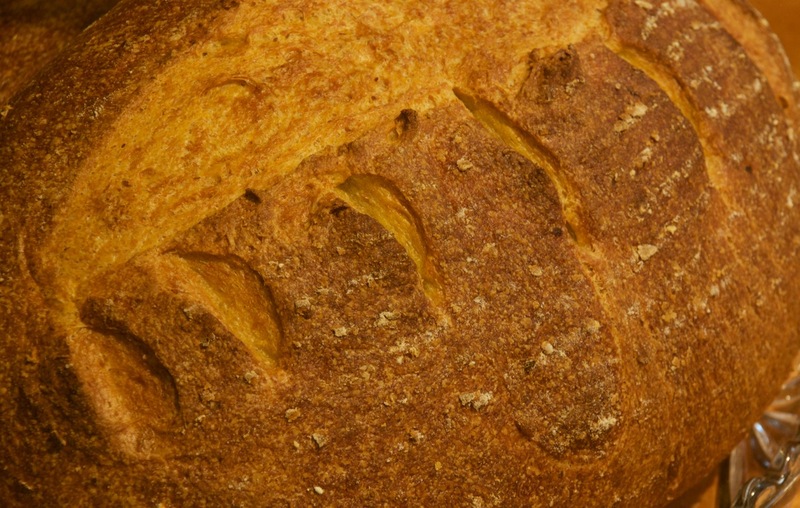 Beautiful loaves even if they remind me more about eating like a dino than seeing one. I'm sure you would have enjoyed the crust for sure on this one. I would think your current residence probably has some dino sightings :) and this one would go fine. Can't wait to try this! Homemade ricotta plus potatoes - yummy. I don't currently have a levain going and won't start a new one until I can bake regularly (after arm & hand issues improve). 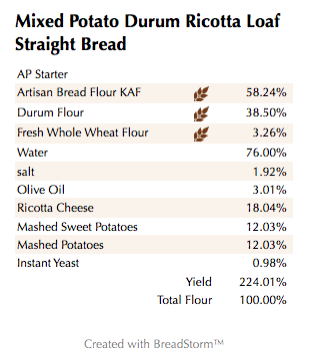 What would be the ratios for a pre-ferment to substitute? I know the flavor will be different, but we'd like to otherwise try the recipe as written. If my husband wants good bread he'll help. Thanks! Sorry for the delay in responding. If you want to make this as a straight dough with no levain you can follow the formula I posted at the end of the original post. 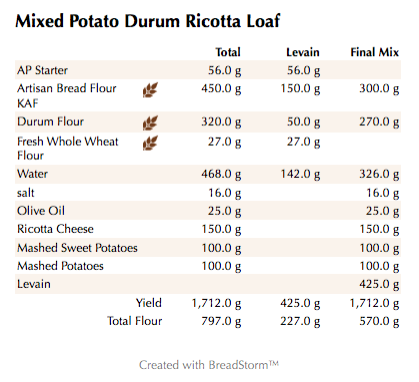 You can also make a Biga with the same amount of flour I used for the original Levain and make sure to add 34 grams of flour for the seed starter and 22 grams of water. Let me know if you have any other questions and please let me know how it comes out.